This past November I introduced you to the white rhinos of Mosi-Oa-Tunya Park in AWF”s Kazungula Heartland, and shared the good news that two were pregnant. Now I am thrilled to tell you both cows have given birth. 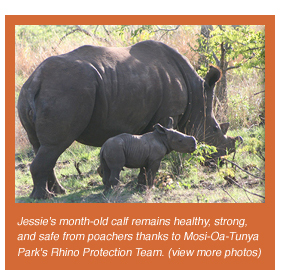 Jessie dropped a female calf on December 9th. And Nelly gave birth just yesterday to a female calf. Both calves appear strong and are thriving, though only with time can we be assured of their survival. Just over a year ago, AWF helped wildlife authorities settle four new white rhinos in the park after all but one of Zambia”s rhinos were killed by poachers. The four new rhinos joined the sole survivor, a bull named Fwanya (*or* “rascal” in the local language). AWF has since supplied ongoing field and technical support to the park team dedicated to keeping the rhinos safe. Jessie and Nelly now have their work cut out for them. Baby rhinos depend heavily on their mother”s milk for as long as a year, and don”t start eating grass until they are about three months old. The cows must also keep both themselves and their charges out of harm”s way.Relentlessly hunted for their horn, more than 300 rhinos have been killed in southern Africa in the past year alone. These barbaric slayings have especially impacted the black rhino population, which is down to about only 3,000 individuals across Africa. If this keeps up the African black rhino will soon be extinct and the white rhino hunted ever more ruthlessly. Both the cows and their newborns are being heavily protected and kept out of sight of tourists until they are stronger. The new births give us hope in this new year that with your support, AWF and its partners can help put an end to the poaching wave decimating Africa”s rhino population. But we need your help. 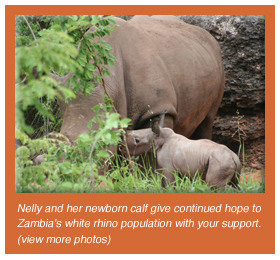 Please consider making a donation in honor of the baby rhinos today. Thank you for all your support as well as the many well wishes. My husband and I were lucky enough to see all 5 of the rhinos just one week before the births. I am so glad to see they are still thriving and hope for their continued survival. Is there any way to get continued updates on this crash of rhinos?